Each year, my workplace acknowledges Public Safety Canada’s Emergency Preparedness Week in early May by hosting guest speakers, themed events and trivia draws. This year, the coordinator, Kristina, recruited budding chefs for the ultimate challenge – 30 minutes to make a creative and impressive meal from pantry staples. The scenario: a local disaster has trapped you in your house for several days without power. Your perishables are gone and you only have an ethanol gel stove to use – and guests are on their way! Never one to shy away from a challenge, I immediately began brainstorming meal ideas. After quite a bit of frustrating thought (really what CAN you make without fresh herbs or produce? ), an entrée and dessert were chosen. Spicy green Thai curry shrimp followed by bruléed bananas Foster – after all I did receive a kitchen torch for Christmas and it would still be full of butane! I must confess – I didn’t necessarily have all the ingredients in my pantry. But anyone who knows me wouldn’t doubt I might’ve had them. Any good competitor knows proper planning and preparation prevents poor performance. I decided I would treat the spoils of my trial run on the eve of the big day. Sadly, my can of bananas didn’t really work as I was hoping (they were pink, mealy and sourced from Thailand). Time to launch into Plan B: Tropical Trifle. Once the meal was over, I made my notes – after all 30 minutes with an ethanol stove was not very forgiving considering I needed to soak rice vermicelli noodles in ‘hot’ water. There must be a precise plan and order of tasks to complete my two course meal. The challenge began with lighting the stove (kitchen torch saves the day) and warming a pan (full of water in my case). A projected Chopped-style 30:00 minute countdown was set and the action began! 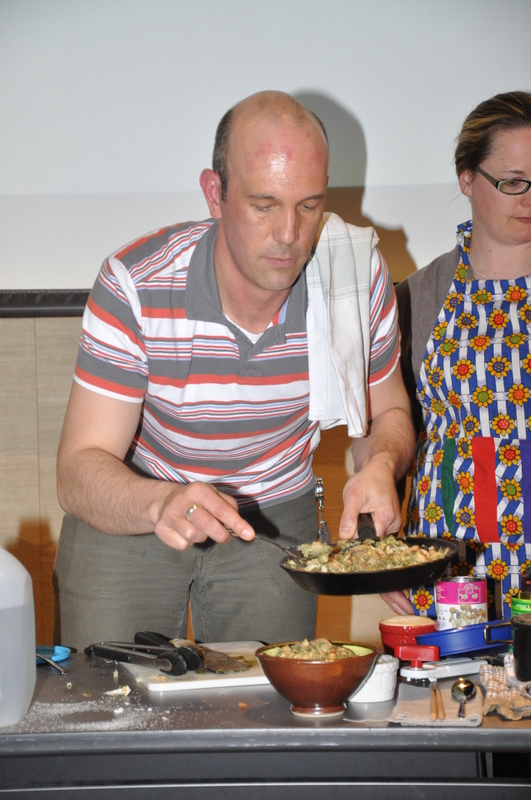 Some competitors had an appetizer ready in minutes – another was heating military rations. I consulted my list and began knocking the tasks off the list. Soak the rice noodles. Shake coconut milk with instant pudding powder *ahem*. Chop and mince and sauté onion and ginger (they keep for a few days during a natural disaster, right?). Open and drain cans of spinach and chick peas. Slowly build the entrée flavours. Remember to add canned shrimp at the last minute, lest they resemble mush! Layer the trifle – crushed flaky sugar cookies, chopped canned pineapple, coconut milk pudding and vanilla sugar. Assemble the entrée. Rice vermicelli, shrimp green Thai curry – strategically place extra shrimp on top. Serve in hand thrown glazed ceramic bowl with hand carved chopstick. Quick – brûlée the vanilla sugar and serve alongside the main. Oh my, 8:00 minutes to spare. I guess I could have let the curry simmer a bit longer. After an excruciating fifteen minutes, the top three are announced. An authentic Indian curry with handmade roti, crab chowder and yours truly taking top spot! A thrill – and a bit of a surprise! Now what to make for tomorrow night?!? Want to make Claude’s creations? Follow these links or go to the favourite recipes page.